For some of you, these words must sound like some sort of European shopping list. But if you read music, each word means something very specific. The gospel works like this. To those outside, the language of the church must sound alien—maybe even intimidating. It would be the same as handing someone a page of sheet music. If they can’t read music, the page must seem like a foreign set of symbols. Even if they read music, they may catch only a sense of the composition—something only made complete by hearing it out loud. We would call that “mission.” To be on mission means to live out the gospel in every facet of life, so that those who don’t speak our language can hear the gospel “out loud” in the lives of Christ’s followers. Yesterday, we learned how Paul’s church-planting efforts led to the conversion of a woman named Lydia. Now, we return to his church-planting efforts in Philippi to understand some of the cultural background of Paul’s journey. She’s not merely enslaved by an evil spirit; she’s also enslaved by a culture that takes advantage of her for profit. There’s a lesson here. Christianity will always be attractive to some—like Lydia—but offensive to others. And when the gospel challenges the prevailing songs of self-satisfaction that come from “personal spirituality,” well, then you have a recipe for ridicule, disbelief—even persecution. So when this happened to Paul and Silas, they were placed in prison. The only thing more staggering than the earthquake was the fact that Paul and Silas didn’t use it as an opportunity for escape. Jailers were often older, retired military servicemen. They had one job: to keep the prisoners in jail. If they failed? They could expect death—or worse, torture at the hands of the Roman officials. So the jailer saw suicide as preferable to facing his superiors. Paul’s choice to remain saved the man’s life. Together they went to the man’s household—where the entire family heard the gospel. “Believe in Jesus,” Paul says, “and your whole house will be saved.” What does he mean? Surely he’s not saying that if the jailer believes, the rest of his family can be “grandfathered in.” No; I think what Paul is saying is that the belief in Jesus is what saves—regardless of whether you personally witnessed such a miracle. Sure, the jailer witnessed something powerful. But ultimately it was faith in Jesus that brought him deliverance, and the same became true of his family. The point? Most of us will never spend time in a Roman prison. But all of us have opportunities to live out the gospel in front of others. In that sense, we are all missionaries to the various parts of our culture, and to a world that longs to hear the gospel’s beautiful melody in a world full of static and noise. By this time, Paul is surely in prison in Rome. In our next posts, we’ll look at the way Paul leaned on this fledgling church for support—and cautioned them about the rough days ahead. Welcome to Day 1 of our new devotional series on the book of Philippians. There will be a total of 15 writings and readings that come out daily on Monday to Friday of the next three weeks. Today and tomorrow Chris and I begin by giving some of the background of the Christians who comprised the church at Philippi, which was one of the better fellowships of those we see in the New Testament Scriptures. The letter to the Philippians rings with a theme of joy. We can have joy in all circumstances, even if we don’t always have happiness. It depends upon our measuring stick. If our measuring device is only limited to the circumstance and events of our immediate physical world, well, we are going to come up short quite a bit. But if our measurement is calibrated in eternal numbers and true realities, we are in possession at ALL TIMES of God’s magnanimous grace and the promise of His eternal relationship with us. Philippians is a prison epistle – written by Paul while chained to a Roman soldier. But you’d never know it by the joyful tone of his writing. 16:1 Paul came to Derbe and then to Lystra, where a disciple named Timothy lived, whose mother was Jewish and a believer but whose father was a Greek. 2 The believers at Lystra and Iconium spoke well of him. 3 Paul wanted to take him along on the journey, so he circumcised him because of the Jews who lived in that area, for they all knew that his father was a Greek. 4 As they traveled from town to town, they delivered the decisions reached by the apostles and elders in Jerusalem for the people to obey. 5 So the churches were strengthened in the faith and grew daily in numbers. Paul and Silas pick up a new partner in Timothy. This occurred in Lystra – the same place where, on the first missionary journey, Paul was stoned, believed to be dead, and dragged out of the city. He dusted himself off and went back into town to finish his sermon, and it was then that Timothy was saved and came to belief in Christ. (Actually, I don’t really know if that is how it happened – I just made that up! But in that Timothy is later called by Paul “my disciple in Christ,” it would appear certain that he came to faith during the prior ministry of Paul in that town.) Here, in Luke’s fashion, he briefly introduces Timothy – a young man who will be a major player later in the Acts narrative. The churches of the South Galatian region were revisited, and Paul used the opportunity to encourage them with the decisions of the Jerusalem Council (Acts 15) and to continue to build them up in the faith. 6 Paul and his companions traveled throughout the region of Phrygia and Galatia, having been kept by the Holy Spirit from preaching the word in the province of Asia. 7 When they came to the border of Mysia, they tried to enter Bithynia, but the Spirit of Jesus would not allow them to. As they travelled on to the northwest, it seemed that the Spirit was closing door after door that one would presume should be open! It is a pattern of the Christian experience that when God closes doors, it is to move us on to a greater open door we might not have otherwise found on our own. And so Paul and his companions travel all of the way to the Aegean Sea – to the town of Troas. Here we see in verse 10 the first mention of the pronoun “we,” which certainly indicates that Luke himself had now become a part of the travelling team. 8 So they passed by Mysia and went down to Troas. 9 During the night Paul had a vision of a man of Macedonia standing and begging him, “Come over to Macedonia and help us.” 10 After Paul had seen the vision, we got ready at once to leave for Macedonia, concluding that God had called us to preach the gospel to them. You have probably heard the phrase, “Go West, young man!” This was the quote of the famous 19th century newspaperman and author Horace Greeley – who greatly favored American expansionism to the west in the then-popular concept of Manifest Destiny. While the justice of this era of American expansion may be debated, God had a manifest destiny for the Gospel message to spread to the west. And today’s passage records one of the great moments in world history – when the message of Christ went from Asia to Europe. In Troas, Paul has a dream that he understands to be from God – a vision of a man of Macedonia calling to him to come there. This is the region of northern Greece; and to travel there would require a multiple-day trip by sea. 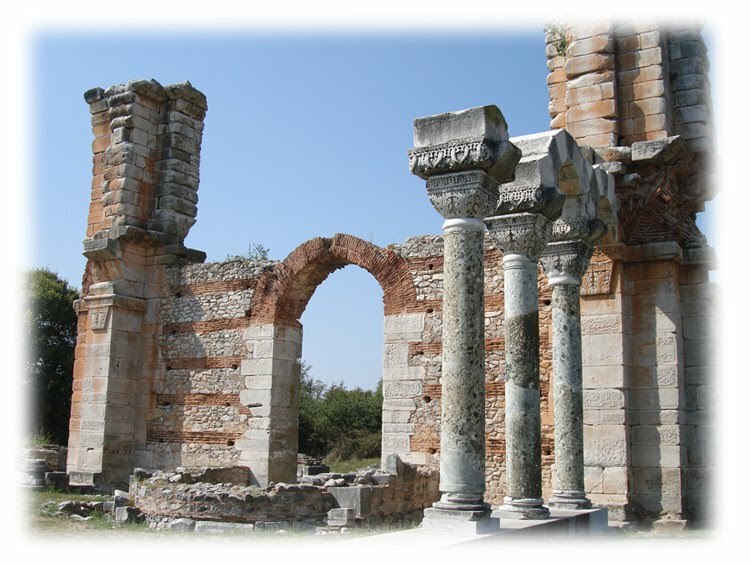 The group ends up in Philippi – a significant Roman city named after the father of Alexander the Great, Philip of Macedon. On the Sabbath day, the group goes to a place along the river – a place known to be a spot for prayer. And there they meet a business woman named Lydia, who is described as a worshipper of God. Though not a proselyte, she was one who believed and worshipped the one true God, and the Lord brought the truth of the Gospel to her and her household … and to the European continent! Moreover, as you Philippians know, in the early days of your acquaintance with the gospel, when I set out from Macedonia, not one church shared with me in the matter of giving and receiving, except you only; for even when I was in Thessalonica, you sent me aid more than once when I was in need. God’s expansive grace reverberates down through the corridors of time and across the centuries to our own day. And his desire continues to be that we too look for those open doors he will supply for us to press through and share the message of Christ’s work with those who are yet to know God personally.